Wajam launched a new social search experience today and it just might answer a lot of user criticisms about Google’s Search Plus Your World. With a new design that displays social search results to the right of organic search results (yes, it bumps PPC ads down the page), Wajam’s social search seems nonintrusive, is completely opt-in, and has one very important feature Google’s SPYW lacks: incorporated Facebook and Twitter results. On sign-up, users give permission for Wajam to connect with each of their social networks to crawl, extract data, and aggregate from friends’ results in real-time. Google has been doing this with Search Plus Your World, launched back in early January. However, Google+ just doesn’t have the user base yet to bring back relevant, current results as often as a product that has user permission to crawl interactions behind the personal privacy walls on Facebook and Twitter. For those seeking a truly social search experience, it must include the platforms on which you’re active and social. Filters allow users to see results from all three social networks, or only those they select. Results may also be filtered down to those by specific friends, or by relevance or recency. The interface is clean and well organized, with results also sorted by type: links, photos, or videos. 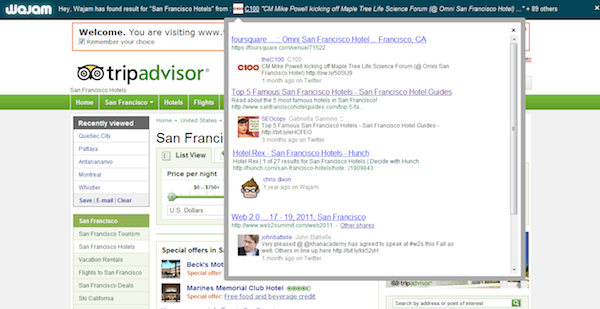 Users can search from Wajam.com, or through the Wajam Social Search Everywhere Plug-in, which brings social search to users wherever they seek information, including on Google, Bing, Ask.com, TripAdvisor, YouTube and more. Wajam launched about a year and a half ago. Since then, they’ve aggregated more than 1.8 billion pieces of content within their index; to give an idea of scale, it took Google two years to get 1 billion results in their index. The speed at which they index is greatly assisted by the fact that each time a new user joins Wajam, their content is indexed. They aren’t trying to compete with Google, Archambault said. Indeed, a run through the results shows a lot of promise for those interested in viewing friend recommendations alongside organic results. Relations between Google and their social competitors Facebook and Twitter may be strained, so it’s refreshing to see a neutral party wade into the fray to combine all of their data and offer the service many users want. Wajam aims to become the premier social search API solution (their API is currently in alpha mode for third parties), according to Archambault. Wajam will also add user support for LinkedIn and Foursquare in the coming months.